There’s so much wrong with this poster. It’s an ad for HSBC I spotted in the airbridge at Athens airport. It shows a terracotta warrior, most definitely from China, wearing Havaianas, famously Brazilian. 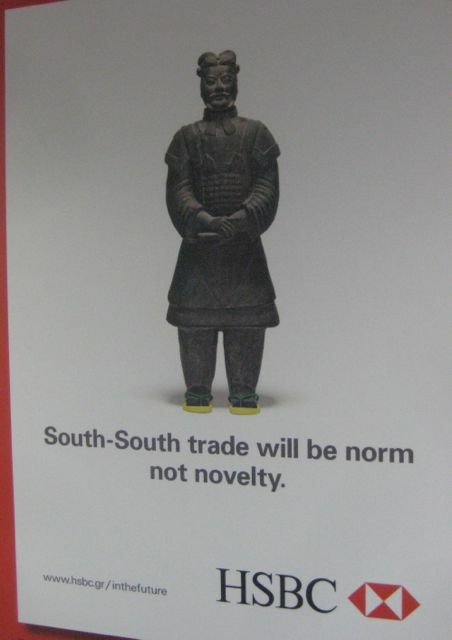 The slogan says “South-South trade will be norm not novelty”. Well we can get the grammar out of the way, norm and novelty need articles in this sentence structure so it should read “South-South trade will be the norm, not a novelty”. But the thing that struck me most forcefully, and prompted me to rummage for my camera on the way down the airbridge was the implication that China is South. It’s not, it is entirely in the northern hemisphere, and Beijing is further north than Athens. Maybe HSBC wanted to reference the BRIC nations (Brazil, Russia, India, China), but that makes no sense – of the four Brazil is the only nation that is in the southern hemisphere and even then small parts of the north part of the country are above the equator. Maybe they meant that trade between the southern hemisphere nations will become normal – except it already is. Unsurprisingly nations tend to trade with their nearby countries so Australia is big trading partner for New Zealand, and Chile is a major trading partner for Brazil. (According to the US State department site). And if it’s China’s role HSBC were seeking to advertise – they’re already a big trading partner for Australia, Brazil, South Africa and New Zealand. In other words; it’s already normal, not a novelty. In any event the sign is part of the bank’s “in the future….” branding; maybe in the future HSBC will use an atlas before they write the copy for their campaigns.